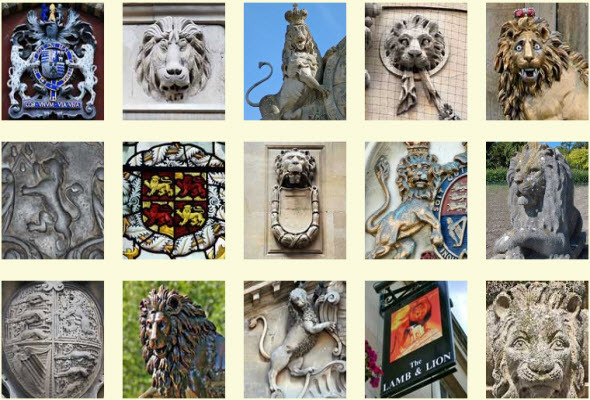 There are over 500 lions around Bath, which reflect the royal heritage of the city. Regarded as the founder of the City of Bath. Sculpted in 1859 by Pieroni in 1859 it stands in the Parade Gardens. The statue has had a somewhat chequered career of movement having once stood on the top of a fountain in Bath Street it was moved from that site in 1872 going to various addresses on Entry Hill and to the gardens of a nursing home. The statue of King Bladud overlooking the King's Bath at the Roman Baths carries the date of 1699, but its real age is felt to be much older than this. Gnaeus Julius Agricola (40AD - 93AD) was a Roman general responsible for much of the Roman conquest of Britain. He was given a military command in Britain and when it ended in 73AD he was made a patrician in Rome and appointed governor of Gallia Aquitania. He was made consul and governor of Britannia in 77AD. He conquered much of what is now Wales and northern England, and ventured into lowland Scotland, where he established Roman dominance for a time. There is some speculation that he may have launched an expedition into Ireland as well. He was recalled from Britain in 83AD after an unusually lengthy service, and thereafter retired from military and public life. 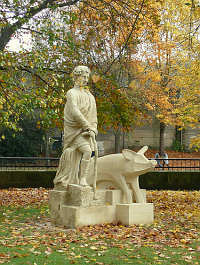 The statue of Agricola is located at the Roman Baths ovelooking the Great Bath along with others statues. The famous statues (see one of main pictures above) represent Roman emperors and generals including Claudius, Constantine, Hadrian and Suetonius Paulinus who defeated Queen Boudicca. All but one were carved by the sculptor G. A. Lawson and erected by the architect John McKean Brydon (also the architect for the Victoria Art Gallery) ready for the grand opening of the Roman Baths to the public in 1897. However the statue of Julius Caesar is only 18 years old; the original statue of Caesar was vandalised in the late 1980s and a new one was commissioned. 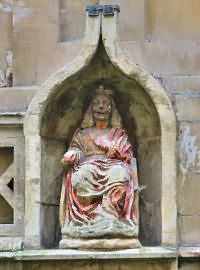 The sculptures appear to be 15th century and depict King Edgar and King Cole (of the nursery rhyme fame). 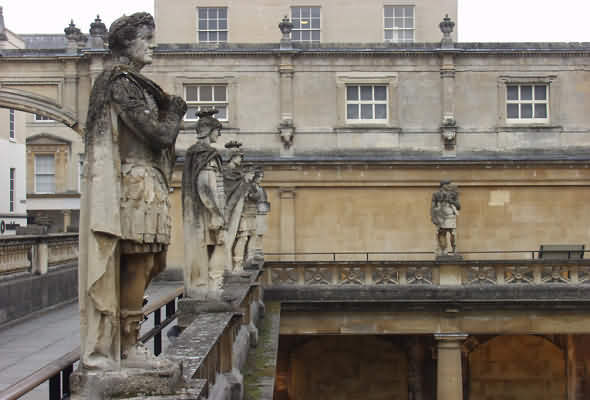 Cole was the first English king to reside in Bath after its restoration under Gnaeus Julius Agricola, he began his reign in AD125. Edgar, shown in armour, was crowned in the Abbey Church, King of England 11th May AD 973. They may have been placed on the earlier thirteenth century Bath bridge fortifications but the first known siting is on the north face of Inigo Jones' Town Hall of 1625 and then on the old Guildhall. They were removed when building work started on the new Guildhall (Atwood, architect) in 1766. They arrived in Bath Street along with a seated figure placed in a niche on the south face of the building which was the City museum at that time. The third figure collapsed in the 1960s. The two statues as seen today had restoration work carried out in 1983. This white marble fountain depicts a life size young girl in eastern costume pouring water from a vase into a bowl supported by pillars and carries the inscription ‘Water is good for you’. Erected by the Bath Temperance Association in 1861. It had a further figure in bronze added in 1986. Rebecca Fountain, located by Bath Abbey – junction High Street, Cheap Street and Orange Grove. The fountain was originally used as a drinking fountain and running water was a feature until the 1980s. 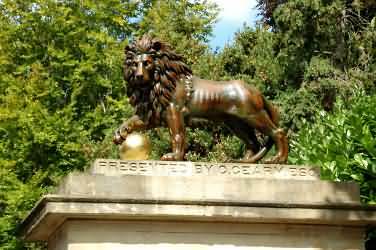 Two bronze lions, one each on the entrance portals to Victoria Park, once called the Rivers Gate after the lady that presented the land to the City but now known as Queens Gate (from Queens Parade). The animals are almost identical except for a left or right front paw resting on a ball. Benefactor Mr C. Geary attended the first city meeting called to discuss the planning of Victoria Park in 1829. The statues were unveiled 1831-1832. The Victoria Art Gallery building was designed in 1897 by John McKean Brydon. Located on Bridge Street. 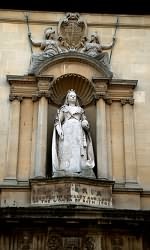 The exterior of the building includes a statue of Queen Victoria (see one of main pictures above), by A. C. Lucchesi, and friezes of classical figures by G. A. Lawson. The Gallery was named to celebrate Queen Victoria's sixty years on the throne. 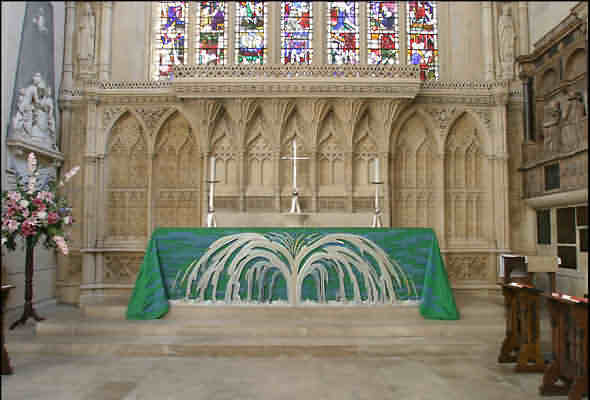 It is run by Bath and North East Somerset council and houses their collection of paintings, sculpture and decorative arts. It includes over 1,500 decorative arts treasures including a display of British oil paintings from 17th century to the present day including works by Thomas Gainsborough, Thomas Jones Barker and Walter Sickert. A difficult to see sculpture of the Good Samaritan sited on the on the pediment above the entrance doors to the extension of The Royal National Hospital for Rheumatic Diseases which is squeezed down a side street. Located at - Upper Borough Walls, Bath, BA1 1RL. 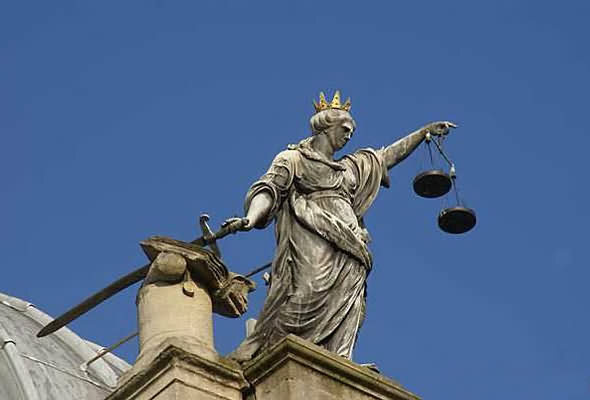 The Scales of Justice statue (see main pictures above) is positioned at the top of The Guildhall which was built between 1775 and 1778 by Thomas Baldwin to designs by Thomas Warr Attwood. It has been designated as a Grade I listed building. 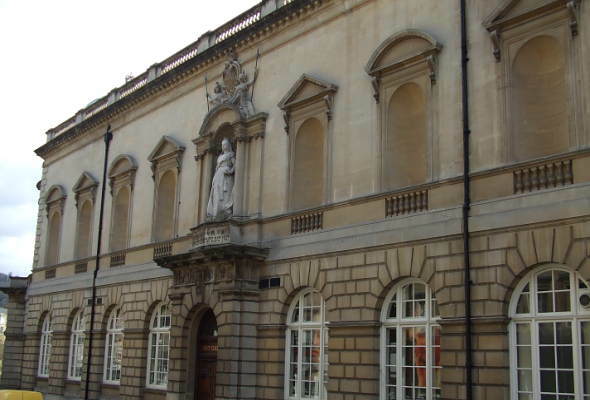 The current Bath stone building replaced a Stuart Guildhall, built in 1625, which itself replaced an earlier Tudor structure. Located at High Street, Bath, BA1 5AW. 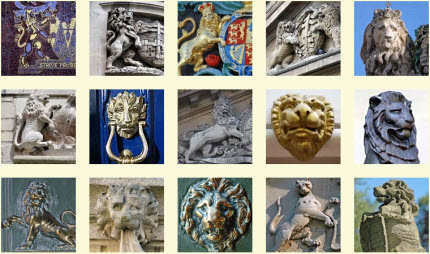 A lion is featured on the City of Bath Coat of Arms, which represents the crowning of King Edgar, the first king of all England, in Bath in 973 AD. Why Lions? The lion has been the symbol of royal England for nine hundred years, since King Richard I (Richard the Lionheart) carried a shield emblazoned with three golden lions to battle in the Crusades. 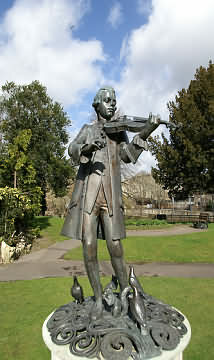 The young Mozart depicted playing his violin (after the famous Salzsburg statue) standing on a raised, pierced and scrolled bronze base, adorned with three doves, two squirrels and a mouse at Mozart's feet. Located in Parade Gardens. David Backhouse and unveiled in 1991. Mrs Purnell made a death-bed wish that the statue would commemmorate her music loving son. She died three months before coming to live in Bath. Opening ceremony was attended by Yehudi Menuin (Trustee of Festival) and MP Chris Patten. The Bath Mozartfest is an annual classical music festival (in November) founded in 1991 by a generous bequest from a local resident. It now regularly attracts top international artists to perform the works of W A Mozart and related composers to capacity audiences. It is renowned for excellence and quality and receives the highest critical acclaim from both local and national media. Orchestral, choral and chamber concerts are performed in the Assembly Rooms, Guildhall, Bath Abbey and the Forum. For further information about the festival see - www.bathmozartfest.org.uk. Life-size statue of Angel of Peace standing on a towering shaft. The front of the shaft has a bronze circular wreath containing a bas-relief head of King Edward VII (facing right). Located at foot of steps in north-west corner of Parade Gardens, overlooking the River Avon. The statue was sculpted by Newbury Abbot Trent. 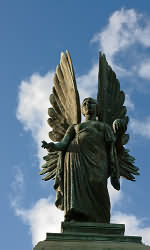 Trent also completed a similar Edward VII memorial Angel of Peace for Brighton/Hove located between Brunswick Lawns and the Esplanade opposite Brunswick Terrace on the boundary between Brighton and Hove. On bronze plaque at statue base wording reading; ERECTED BY THE CITIZENS OF BATH IN MEMORY OF EDWARD THE PEACEMAKER and on Bronze wreath below statue: 1901 (on left of head) 1910 (on right of head)/ EDWARDVII. Bath became a popular town among the rich and the beautiful of this time. Among them was also William VI., Prince of Orange who came to Bath to have his illness cured. The water from Bath's thermal fountains was said to heal almost everything - from rheumatism to asthma, from itches to deafness. At least, it seems that it cured the Prince of Orange, so that Richard Beau Nash had an Obelisk erected for him in 1734. It was rebuilt in 1834, after it almost collapsed during the centuries. Today, it can be seen at a traffic island at Orange Grove (named after the Prince of Orange), close to the abbey. The memorial obelisk was designed by Rev. William Borlase (well known as an historian of Cornwall). Borlase arrived in Bath with his friend Dr. Oliver in 1730 from Cornwall. Oliver was treating Borlase for ill-health and used the Bath mineral waters as part of his treatment. He returned to take up a vicarage back in Cornwall in 1732 and lived to a ripe old age! Dr. Oliver invented the famous Bath Oliver Biscuit. Royal Victoria Park was opened in 1830 by young Princess Victoria who was aged 11 years. An obelisk was dedicated to the young Princess, the foundation stone of this was laid in 1837 (when she was 18 years old) and originally had Russian guns captured in the Crimean war nearby, however these have been removed. The monument was completed the following year when her Coronation took place. Slim, tapering, elegant obelisk descending to triangular pedastel and plinth that carries three lions couchant. The north side carries a Royal coat of Arms in bath stone in a shallow niche. The east side has a portrait of the young Victoria, facing right, and inset a surrounding wreath. The south side carries a Royal Coat of Arms (probably of Prince Albert) in bronze. The whole erection surrounded by a circular balustraded stone enclosure. The obelisk was designed by George Phillips Manners and paid for by public subscription. George Phillips Manners (1789 - 1866) was an English architect and City Architect to Bath from 1823 to 1862. In his early career he worked with Charles Harcourt Masters and after about 1845 was in partnership with C.E. Gill. He retired in 1862. 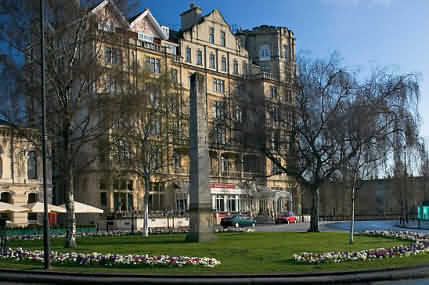 Within Queen Square stands an Obelisk, this records a visit to Bath by Frederick Prince of Wales. Erected in 1738 it was paid for by Richard Beau Nash, designed by architect John Wood and built with stone provided by Ralph Allen who owned the quarries that supplied Bath with much of its stone. Beau Nash's good friend, Alexander Pope the famous English poet, furnished the inscription on the obelisk.